Universal and Illumination Animation had me wanting to buy a ticket for this film since the release of its very first trailer. It feels like over a year since I first saw it, so here I finally am after my viewing and all I can say is that it was well worth the wait. While this film will never come close to becoming a serious contender for this year’s Animated Feature Academy Award, it has quickly wrapped its claws around my heart to become one of my favourite films of the summer thus far. Granted, this summer hasn’t been blessed with too many high quality choices, but that only shows how much better this film is compared to a lot of what we’ve already been given. 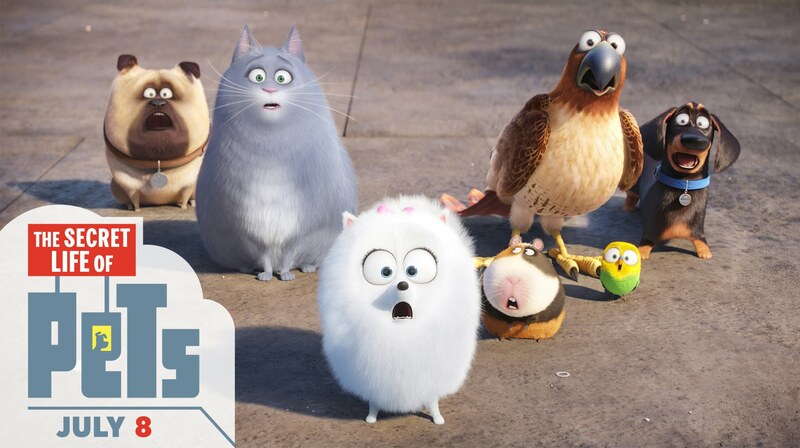 Starring Louis C.K., Eric Stonestreet, Kevin Hart, and Jenny Slate (to name a few), The Secret Life of Pets follows Max (Louis C.K.) a little dog that belongs to Katie (Ellie Kemper) in New York City. One night as Max is eagerly awaiting the return of Katie, she returns with Duke (Stonestreet), a very large and brown dog that Katie found at the Pound. Suffice to say, Duke’s arrival throws Max’s life on a sidestep from his expectations. It doesn’t take long before Duke and Max find themselves alone, together out on the streets of New York City, and up against the anti-domestication ring led by Kevin Hart’s cute and tiny white bunny, Snowball. What makes this animated feature work so well is its pacing, both in progressing the plot and choosing joke timing. I haven’t laughed this consistently during a film since 22 Jump Street. Kevin Hart is a highlight, and while that may be starting to sound like an obvious comment, I found his voice-work here to be a lot stronger than a few of his more recent live action turnouts. This is stand-up comic Kevin Hart, not Ride Along 2 Kevin Hart. Who really stole the show for me though was Jenny Slate’s white puffball dog, Gidget. Equally badass and adorable, Slate brings an intimidating innocence to her character that makes her unpredictable. The story arc for both Max and Duke, I will admit, is entirely predictable, but the film moves so fast and the jokes never stop long enough for this to become a greater problem. There is a great sequence in the middle of the film involving a certain factory that had me dying laughing in my corner of the cinema, that happens just before the most predictable moment. The animation quality from Illumination seems to be getting better with each project they release and this film is no exception. The intro scene that shows landscape shots of this world’s New York are breathtaking. Pixar and Disney are still on another level, but it is starting to become a debate versus animation styles rather than quality, in my opinion. The biggest surprise for me came when I realized that I liked this film more than Finding Dory. While still fantastic, Dory delved a little too far down the emotional drama pipe and at times felt suffocating. That isn’t to say those emotional moments didn’t still work for Pixar this year, it is just impressive to see a film not feel the need to go down that road in order to create an excellent movie-going experience. Let’s not make a mistake here, The Secret Life of Pets is a movie designed and created for children, but there are enough inside jokes here to make this an equally enjoyable experience for adults and teens as well.